Looking to fill up your iPhone or iPad with free apps? Great deals are constantly popping up in the App Store, and here are 62 apps that are now free. 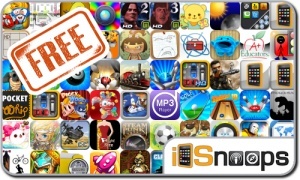 This apps gone free alert includes Aces Traffic Pack, Codename Cobra, MapleStory, PiggyWoogy, Mole Kingdom, Spy mouse, Kingdom Story XD, EZMP3 Player, Doodle Movie Challenge, and many others.